This is a painting on illustration board created by artist, Duane Bryers. 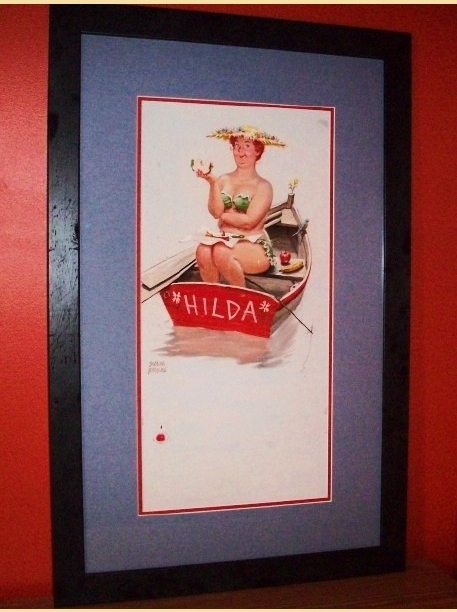 It is one of many in the "Hilda" series of calendar illustrations created by Duane Bryers over several years. The "Hilda" girl was a robust, generously proportioned girl that always seemed to find herself in an awkward situation. She first was brought to life in 1958, and was popular throughout the 1960's. Duane Bryers was born in 1911 in the Upper Peninsula of Michigan. One of his early paintings was a103 foot long mural, showing the history of the mining industry in a Midwest town. He took the $3000 that he earned from that project and moved to New York City, but did not soon achieve success. However, he did win a poster contest at the Museum of Modern Art. While in the U.S. Air Force between 1943 and 1946, he started a comic strip called "Cokey" for the newspaper on the base. That comic strip was eventually syndicated. In his early fifties, he began specializing in Western theme paintings. Duane Bryers was the first commercial illustrator to use a plus size model as the subject of his pin up art. He had many models pose for "Hilda" paintings over the years, but more often than not, "Hilda" was a creation of the artist's imagination. Most "Hilda" calendars used 7 paintings to create each calendar. One image was used for every 2 months, plus a cover illustration. Mr. Bryers currently resides in the Tuscon Arizona area.